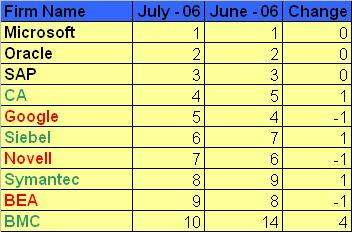 Here are the top ten software suppliers with the highest profile in analyst research over the last seven weeks. It is inevitable to notice that the top three firms still have their feet firmly in the ground. Such domineering contestants seem to be holding a great proportion of the market and not give much opportunity to other players to gain more of an analyst interest. Nevertheless BMC has gained more mentions taking the 10th position whilst CA, Siebel and Symantec clime up a step closer to the peak. Further down the top 25 Software Index, astonishing performance for SSA moving from the 37 position where it stood in June to the 19th position in July. With a big leap of 18 places SSA secures a place in the top 25 league. SeeBeyond experiences the sharpest decline in analysts focus and drops out of top 25, followed by Interwoven and Business Objects. New entrants in the top 25 league this month are also Sungard and McAfee. If you wish to be sent the top 25 Lighthouse Software Index each month please send an email to analysts [at] lighthousear dot com.